What does the ancient paper folding art of origami have to do with science? While origami can be simple and fun for children, the applications of origami in the sciences have been sophisticated and complex. 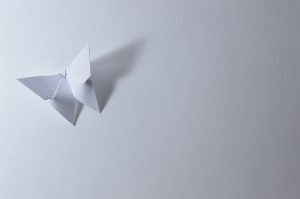 From mathematics and engineering to medical devices, origami has been the inspiration for responsive, elegant, and flexible innovations in science. If you need a study break to clear your mind, try out origami at the Sciences Library. 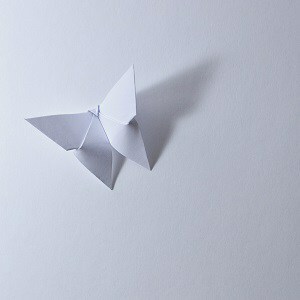 We have origami paper on hand for you. You can use our instructions for simple models, search online for diagrams, or create your own designs! Combining origami with computer programming, Robert J. Lang has designed over 700 exquisite origami models displayed on his website, and he has applied his expertise in origami to problem solving in engineering and physics. 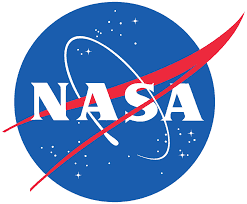 Notably, he helped to design a prototype for a large folded telescope lens that was meant to fly compactly into space within a rocket and then unfold smoothly upon reaching its destination. Researchers at Harvard and MIT have developed self-folding robots based on origami. In their research, it took less than five minutes for their robot to assemble itself from a flat template and then walk on its own. The idea is that self-assembling robots could be sent as flattened objects into tight spaces and then assemble themselves upon reaching their destination. The hope is that these robots could potentially be used in rescue work in unsafe areas due to wreckage or fallen debris. The development of medical devices inspired by the folds in origami is underway. Examples of products being designed are stents, catheters, and drug delivery mechanisms that travel through the body in a collapsed, folded form and then expand to carry out their function. While more research is required before these devices are approved for medical use, it is thought that these origami-inspired designs will be safe devices that are minimally invasive to the body. You need comfortable seating. 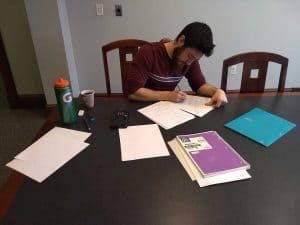 You need short, engaging study breaks. You need homemade brownie bites. All of this is available to you if you study for final exams at the Sciences Library! Don’t wait! 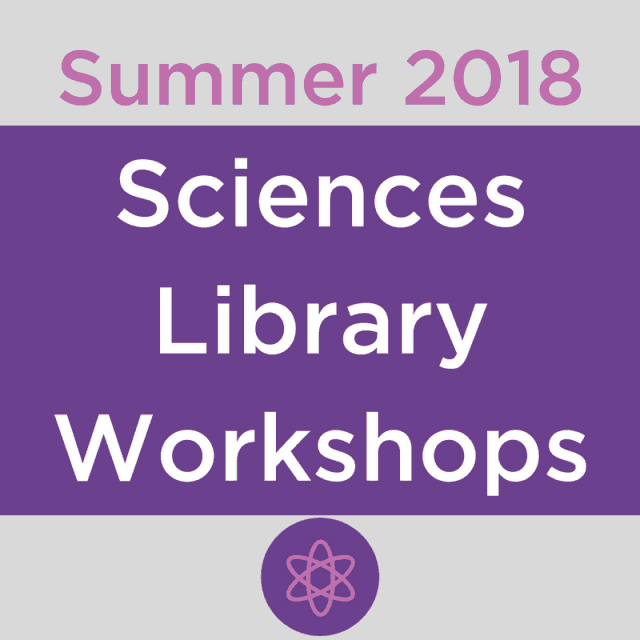 Study at the Sciences Library today! And tomorrow, the day-after-tomorrow, and the day after that … you get the picture, whenever you are ready to study, we are here for you. 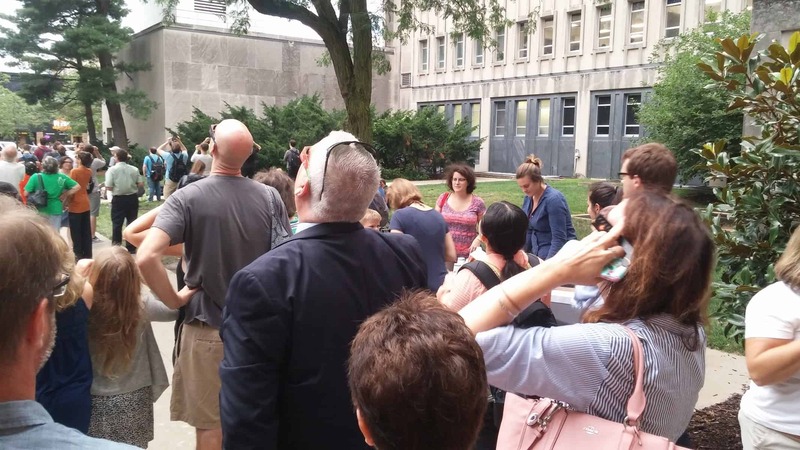 The solar eclipse viewing event at the Sciences Library was a huge success! Thanks to all who attended and many thanks to our partners, the Department of Physics and Astronomy and the Museum of Natural History. In the end, we gave away over 1000 pairs of eclipse glasses! If you wish to recycle your glasses, you can bring them to the Museum of Natural History. 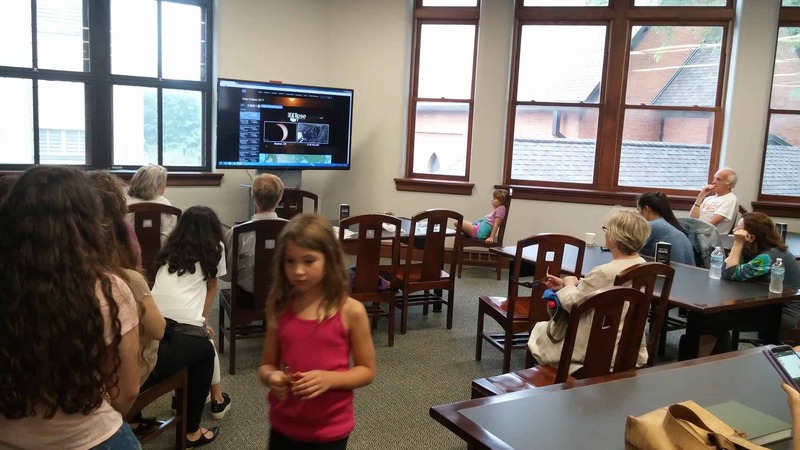 Astronomers Without Borders will donate them to other countries for future eclipses. Hundreds of people visited our courtyard to watch the eclipse as a community. 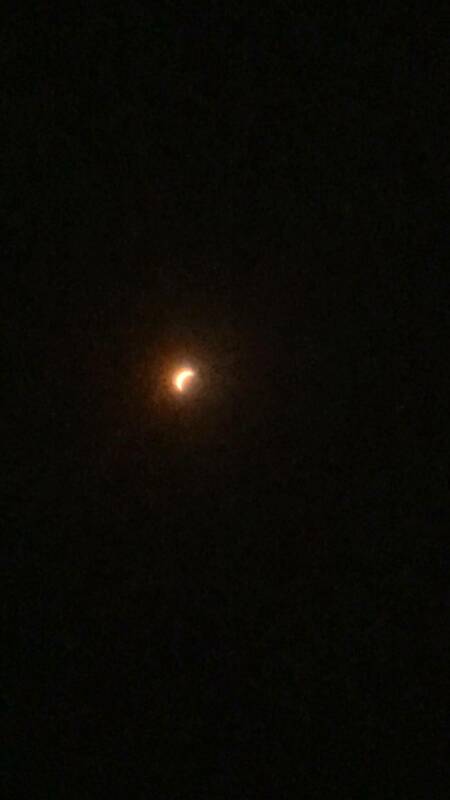 The clouds parted just enough to give everyone a great view of the peak of the eclipse at 1:12 PM, when 92% of the Sun was obscured by the moon. Some also came inside to watch NASA’s live stream of the eclipse, following the path of totality across the country from Oregon to South Carolina. 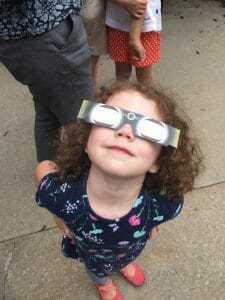 Have you caught eclipse fever? The next total eclipse will be July 2, 2019 and will be visible in South America. Your next chance to see a total solar eclipse in the United States will be April 8, 2024! I can’t wait! 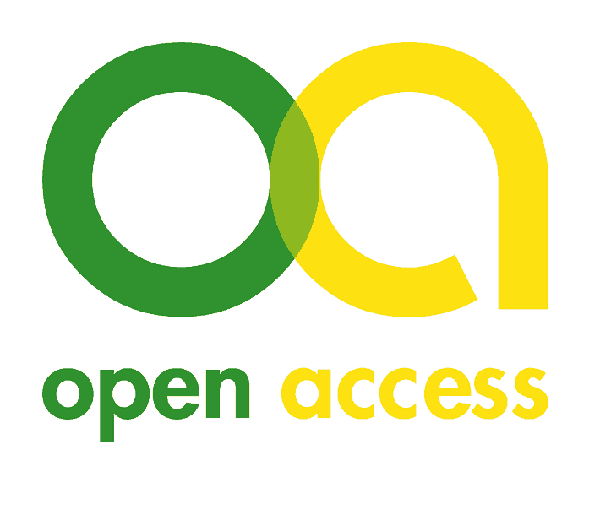 Question: How do I access articles the library subscribes to through Google Scholar? Answer: The answer to this depends upon where you are when searching Google Scholar. If you are using a computer connected to the campus network, Google Scholar automatically detects that and provides a text link to UILink. Follow that link to see if we have access to the article. If you are searching Google Scholar from off campus, you have two options for getting Google Scholar to recognize that you are affiliated with UI. 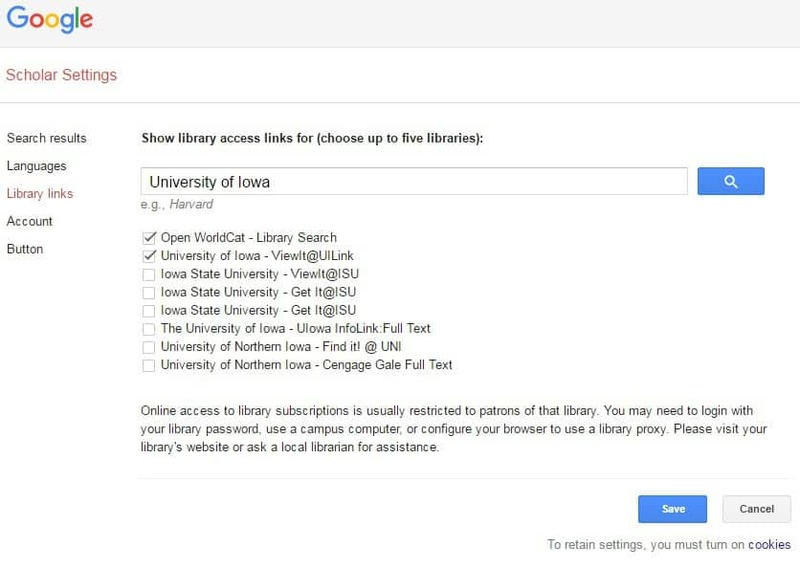 If you use our link (http://purl.lib.uiowa.edu/GoogleSch) from Databases A-Z, you will be prompted to log in with your Hawk ID and then UILink will appear in Google Scholar results. If you are working off campus and prefer to go directly to Google Scholar, you can show it that you are UI-affiliated if you have a Google account. When logged in to your Google account and on the Google Scholar search page, go to Settings in the upper right, then Library links on the left side of the Scholar Settings page. Use the search box to locate University of Iowa, then the check box to turn on University of Iowa – ViewIt@UILink in results. Note: You may need to uncheck “UIowa InfoLink:Full Text” first. And if you want to retain your settings across devices, you must turn on cookies. 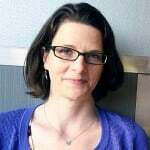 If you have any questions or problems with setting up UILink in Google Scholar, please contact Sara Scheib. 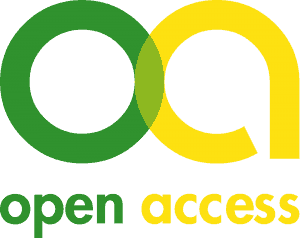 ORCiD Researcher Identifier – sign up today! If you have any questions about ORCiD please contact the Sciences Library. See an example ORCID iD page. 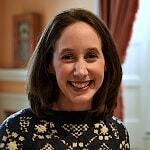 On Wednesday, November 11 at 10:30 – 11:30 a.m., the University of Iowa Libraries will host guest speaker Heidi Imker, director of the Research Data Service (RDS) at the University of Illinois at Urbana-Champaign. 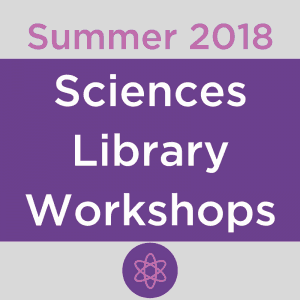 Imker’s seminar, “Capitalizing on Research Data: Management, Dissemination, and Archiving,” will explain how researchers can meet new funder requirements for research data management and leverage public access requirements to increase the visibility and impact of their research. Discussion will follow her seminar. The seminar will be held in the Illinois Room (348) IMU. An informal meet and greet with refreshments will follow. RSVP is requested. Imker urges researchers to view this requirement as an opportunity to regard research data as an important product of scholarly work. Sharing data widely can enhance visibility for researchers, as well as create a collaborative environment of research process verification and results validation. Such activities will be key to increasing the pace of discovery and demonstrating the importance of research. In addition, Imker says higher demand for efficient data management tools means researchers may have better options to choose from when it comes to gathering, analyzing, and depositing data in public access repositories. As director of RDS, Imker oversees a campus-wide service headquartered in the University of Illinois Library. RDS provides the Illinois research community with the expertise, tools, and infrastructure necessary to manage and steward research data. Prior to joining the Library, Imker was the Executive Director of the Enzyme Function Initiative, a large-scale collaborative center involving nine universities, funded by the National Institutes of Health and located in the Institute for Genomic Biology. Imker holds a Ph.D. in Biochemistry from the University of Illinois and completed her postdoctoral research at Harvard Medical School. For more information, please visit http://guides.lib.uiowa.edu/data. To RSVP, please visit: http://tiny.cc/Data11-11-15. Please contact us at lib-data@uiowa.edu if you have any questions.